October 14, 1883 -- A fascinating piece runs in the Chicago Daily Tribune on this date, tracing the development of the roads within the city. The following contains the information found in the Chicago Daily Tribune article in its entirety . . .
“The annual report of Commissioner-of-Public-Works Mr. D. C. Cregier contains some interesting suggestions regarding the early history of Chicago street improvements. Unfortunately they are only suggestions and touch very lightly on a subject of which every detail should be a matter of public record, and probably would be had not the “big fire” destroyed nearly all documents referring to public works in Chicago. The material Mr. Cregier has had at his disposal most, in fact, have been very incomplete, for it is next to impossible to get an unbroken history of the improvements of the several streets from his list of street improvements, which runs back to the year 1835. According to Mr. Cregier’s statement, no printed reports on street improvements were issued prior to 1861, and he has depended largely on notes furnished him by Mr. A. T. Andreas, who is now preparing a book on the early history of Chicago. From these notes it is gathered the first public highway or road was located in Chicago in 1831, running from the public square to the western county line. This was probably Lake Street. In April, 1832, the first street leading to Lake Michigan was laid out, fifty feet wide. In the same year a road was ordered laid out from the Town of Chicago to the Du Page River and to the west line of the county. The next year, 1833, witnessed the completion of the State road from Chicago to the Wabash River opposit [sic] Vincennes. In August of that year Chicago had risen to the dignity of a town, and one of the first orders of the Trustees directed the Town Surveyor to “pitch” South Water street on or before April, 1834. 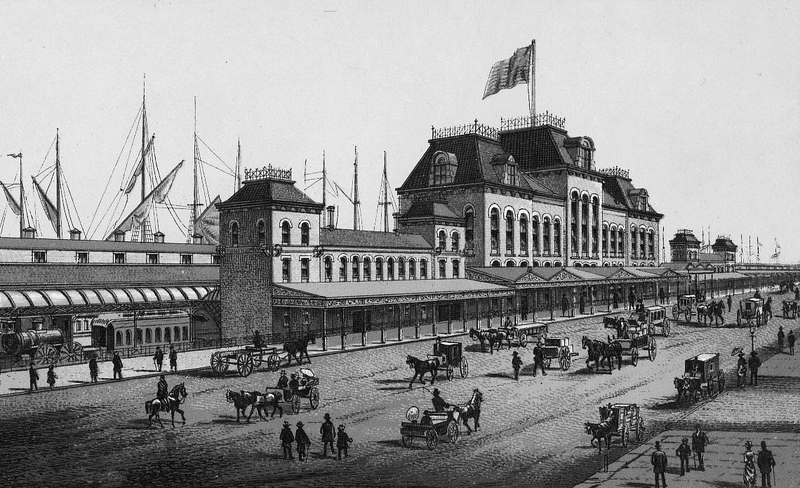 During July, 1834, the same officer was instructed to so “graduate” South Water street “that water should flow from each cross street into the river.” South Water and Lake streets were the two principal thoroughfares, and were the first Chicago roads to receive the attention of the authorities. In 1935 Gurdon S. Hubbard petitioned the Trustees for a rebate on his taxes on account of his having “graded and thrown up” La Salle street between South Water and Lake streets in front of Lots 1 and 2; and in 1836 Canal street was turnpikd as far north as Kinzie street, and Lake and Randolph streets as far west as Desplaines street. In 1937 the “clearing, grubbing, and grading” of the following streets is mentioned in the records: Market, Franklin, Chicago avenue, La Salle, Clark, Dearborn, Union, Desplaines, Peyton, Canal, Harmon, Hamilton, George, Maria, Webster, Spring, Elizabeth, Catharine, and Division streets, representing an aggregate length of four and one-half miles. The records show further that in 1842 North Branch street, from Kinzie to Desplaines street, was graded, and that Aug. 8, 1844, the planking of Lake street from State to Dearborn street was ordered. Randolph street is recorded April 10, 1846, as being ordered graded and repaired from the river to the limits. In 1849 a general improving of streets by planking was begun, which up to 1855 was the only kind of street improvement in use. The streets planked, or rather ordered planked, in 1849 were: Clark street, from the river to Kinzie street; Canal street, from Randolph to Kinzie street; Kinzie street from Clark street to the river; Market, from Randolph to Lake street; Randolph, from State to Dearborn street; South Water, from Lake to Wells street; State street, from Randolph to Lake street. In 1850 Clark street was planked from Randolph street to South Water street and from the river to Chicago avenue and Randolph street from Centre to Ogden avenue. In those two years $31,000 was expended for planking streets. From that time on planking was bravely laid in the streets of the young and growing village, and it was not until 1860 that it was discarded as pavement for much-traveled streets. In the same year a cobblestone pavement was laid down in Lake street, between State and Michigan avenue, while South Water street, from Wabash avenue to the Illinois Central Railroad tracks, received a pavement of limestone blocks. The cobblestone pavement did not last long, it seems, for in 1861 a wooden-block pavement was ordered on Lake street from the river to Wabash avenue, and a year later Nicholson block from Wabash to Central avenue. In 1870 Lake streets was ordered repaved with wooden blocks from Wabash avenue to Clark street; in 1871 from the river to Clark street; in 1878 from Fifth to Michigan avenue; in 1879 from Market to La Salle street with wooden blocks, and from La Salle to State street with Nicholson pavement (the latter, together with Taylor, between State and Clark streets, are the last streets paved with Nicholson). The limestone laid on South Water street in 1855 was replaced in 1865 by wooden blocks, partly renewed in 1870, entirely renewed again in 1878 and 1880. 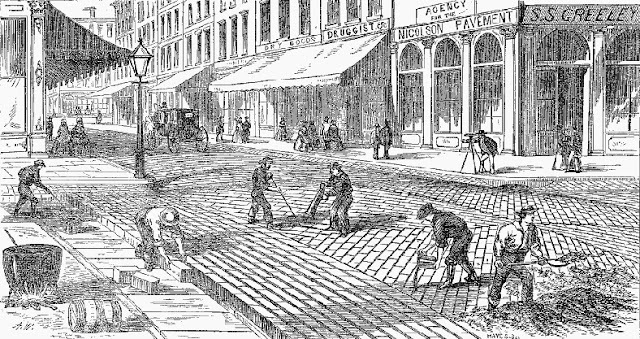 The first Nicholson pavement was laid in the fall of 1856 in Wells street, between Lake and South Water streets. This pavement was not renewed until 1875. Nicholson block was also ordered laid in 1858 in Clark street, between Randolph and Madison (changed in 1873, when Clark street, from South Water to Harrison street, was ordered paved with wooden blocks); in La Salle street, from Randolph to Washington streets (renewed with pine blocks in 1878), and in Washington street, between Clark and La Salle streets (Washington street was ordered paved with wooden blocks from State to Market streets in 1870; in 1878 to be paved with wooden blocks from State to Market streets in 1870; in 1878 to be paved with pine blocks between Clark and La Salle. In 1859 Clark street, between Lake and Randolph, and between Polk and Madison, was ordered paved with Nicholson blocks, which had to last until 1873). Experiments were also made in 1858 with bowlder stone, which was laid in State street, from Madison to Twelfth street *replaced between Randolph and Jackson streets with wooden blocks in 1878; from Jackson to Harrison in 1878 – the street being now repaired with granit [sic] from the river to Jackson street); in Kinzie street, from Clark street to the river (ordered replaced with wooden blocks in 1857; partly renewed in 1873, 1876, and 1881; laid with Medina stone between La Salle street and the river in 1882), and in Market street, between Randolph and Lake streets replaced with wooden blocks in 1871). In 1859 bowlders were tried in Couch place and Haddock place. 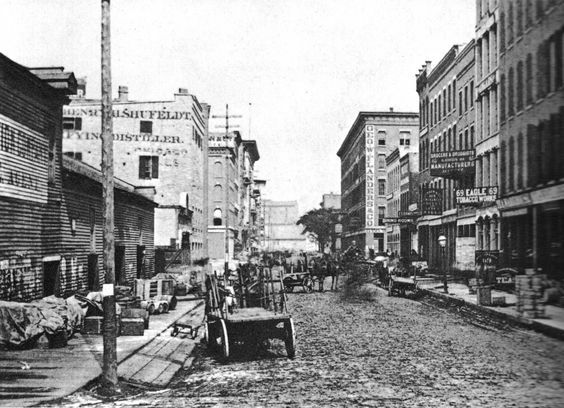 In 1861 the same pavement was ordered for South Water street, between Dearborn street and Wabash avenue, and in 1862 for Clark street, between Lake street and the bridge, and in Kinzie street, between Clark and State streets. No more bowlder stones were laid after that. (All bowlder pavements were replaced with wood pavements immediately after the fire, where they had not been replaced before). A pavement of canal block stone was ordered for Wells street, between Randolph and Madison streets in 1859, which was replaced by wood in 1874. Only little paving was done from 1860 to 1865, all in all about seven and a half miles. Of this the most was macadam. In 1865 the common wooden block pavement made its first appearance. 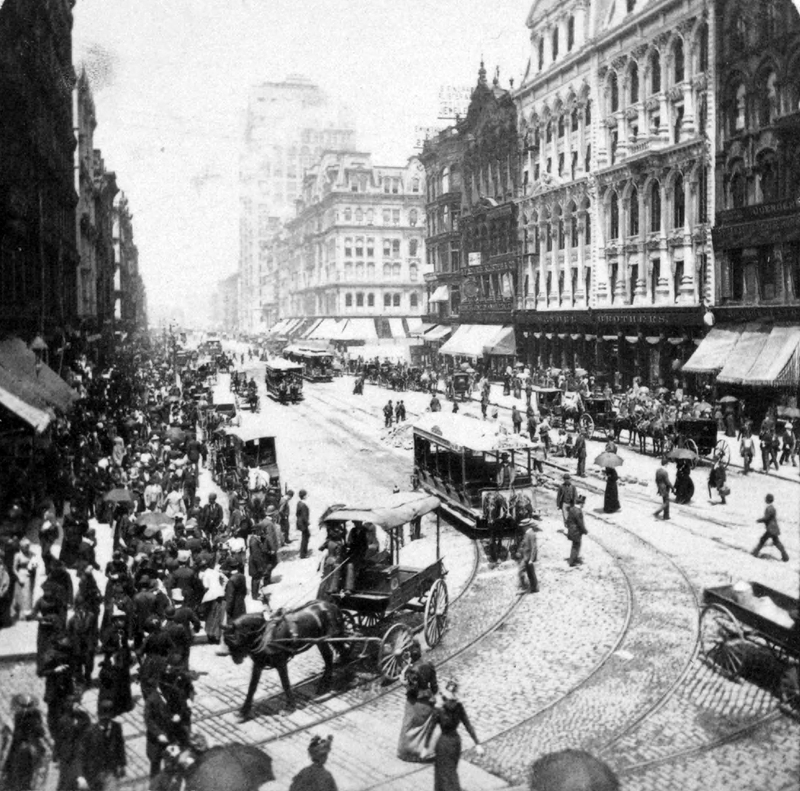 Dearborn, from Madison to Monroe, Fifth avenue from Madison to Van Buren, Michigan street from Clark to Cass street, State street from Kinzie to Michigan street, South Water street between Wabash and Michigan avenues and between Clark and Franklin streets, and Wabash avenue between Randolph and Adams streets being the first streets to be paved with wood. The wooden block pavement held for a short time and undisputed sway, more than 80 per cent of our street improvements being of the wooden kind. In 1869, for instance, nothing but wooden pavement was ordered the total street length aggregating over eighteen miles. The same was the case in 1874, when nine miles, and in 1875 when 11.29 miles, of wooden pavement were laid. In 1876 the first attempt to reintroduce stone pavement was made. 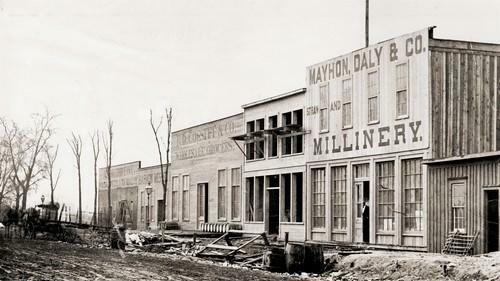 Pacific avenue, between Harrison and Polk streets, was paved with Medina stone, and in 1878 the block between Polk and Taylor streets was paved with the same material. In the meantime the quality of the wooden pavements was deteriorating, and the public wanted something better. The paving question was generally discussed. Cedar blocks were introduced in 1878, and drove the pine block, which had forfeited public confidence, almost entirely out of sight, but only since 1880 the pavement question has approached its solution, since the principle has begun to be acknowledged that a good foundation is the first requirement of a durable pavement. The building of the boulevards did a great deal towards educating public opinion on the street-pavement question, and the success the stone pavement laid, by the government around the new Post-Office seemed to be not without effect. The first step towards applying broken-stone foundation rolled in heavily to other than granit pavements was made in 1881, when asphalt blocks were laid on Twenty-eighth street between Wabash and Michigan avenues, and a year later, when the first street asphalt went down on North avenue, between Menomonee and Centre streets.